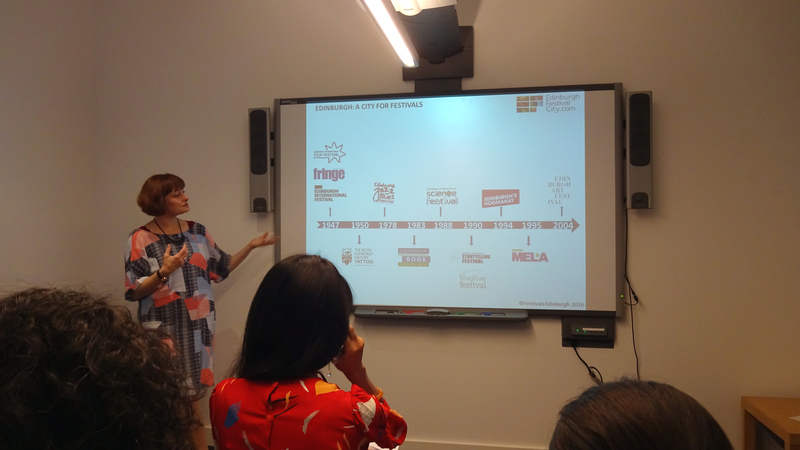 Marsha Pearce reports on her experiences of the Edinburgh Art Festival, which she attended in August 2016 with support from the British Council Scotland, Edinburgh Festivals and Creative Scotland. 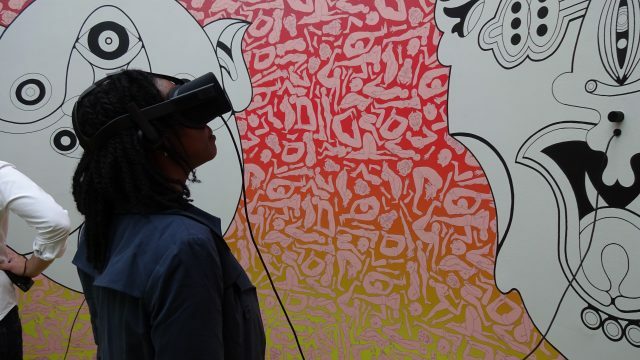 Dr. Pearce was one of three Caribbean visual arts representatives invited to participate in Momentum: Edinburgh Festival’s International Delegates Programme. Established since 2013, Momentum is the Edinburgh Festivals’ International Delegates programme. Each year, during August, leading cultural figures from around the world are invited to engage the Festival City of Edinburgh – Edinburgh hosts 12 festivals annually, five of which are held in August – the wider Scottish cultural sector and the international community. Much of the force of Momentum is characterised by opportunities to make meaningful connections; to weave together events, places, people, ideas, time past, present and future. I am standing in Dovecot Gallery in the heart of Edinburgh, looking at Peter Thompson’s painting Little Foxes (1999), which is on loan from a private collection. It is displayed as part of the exhibition The Scottish Endarkment: Art and Unreason 1945 to the Present – a show that gives a different slant to the 18th-century Scottish Enlightenment and its trust in human reason. The artwork is Thompson’s interpretation of an actual attack on gay men, which took place on Calton Hill. I had just visited the Hill with its incredible view and atmosphere of immense promise. The Hill is the location of the City Observatory, a heritage site listed on the Buildings at Risk Register. The contemporary arts organisation known as Collective is working in partnership with the City of Edinburgh Council to save the observatory and reanimate it as a visual arts space dedicated to acts of looking and thinking. Thompson’s painting, with its half-human-half beast hybrid figures and crucifix-wielding mob, now gives a nuanced awareness of the physical and psychological layers of the Hill. My sense of place and people becomes more complex. 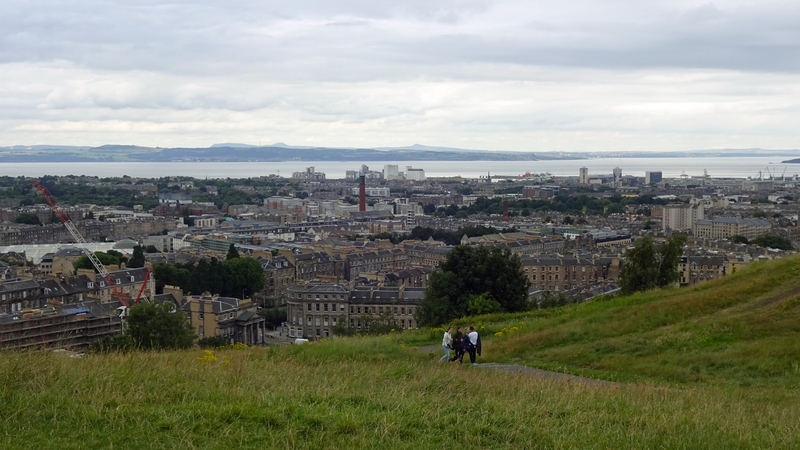 A view from Calton Hill, Edinburgh. Photograph by Marsha Pearce. Further dimension would be added to my understanding by way of a connection between another building located on the Hill and an art piece I would see two days later at the Edinburgh Sculpture Workshop. Kenny Hunter’s exhibition entitled Reproductive! interrogated notions of the original, the authentic and the copy as an inferior version. He advocated the energy and potential of reproduction. 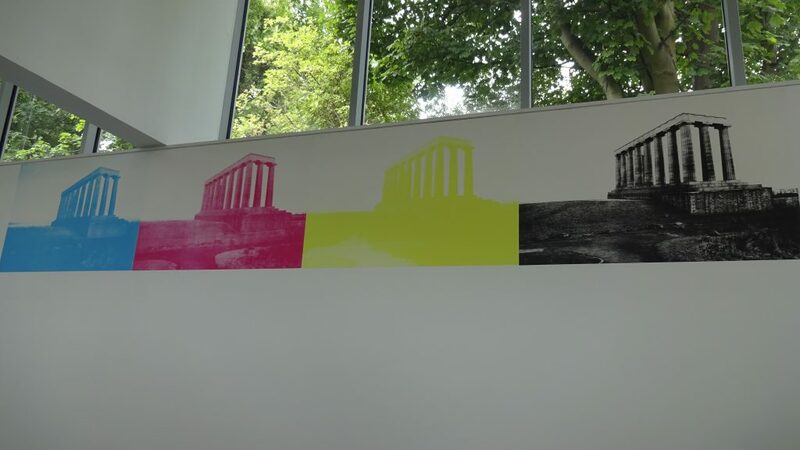 Included in the show was his new silkscreen work National Monument (In Praise of Forgetting), which divides an image of the National Monument of Scotland into the four colour plates – cyan, magenta, yellow and black – used to reproduce a variety of hues and continuous tone in the process of printing. The monument was constructed at Calton Hill in the 1820s to commemorate fallen soldiers in the Napoleonic Wars but remains an incomplete structure today due to a lack of funds and dwindled interest. 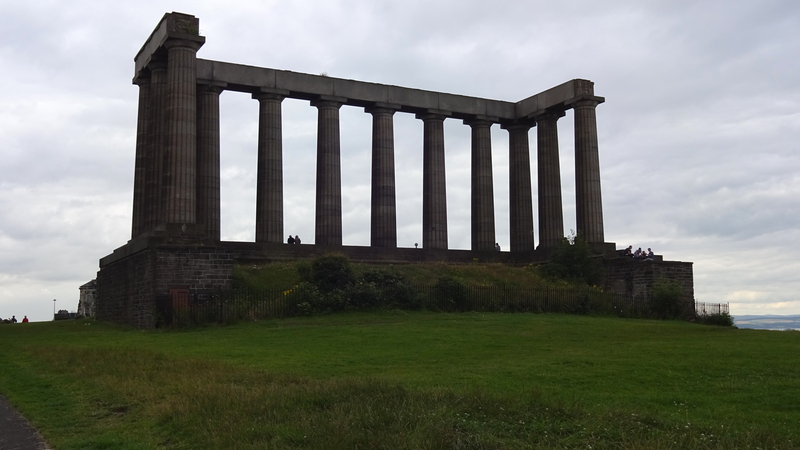 With an aesthetic that mimics that of the Parthenon in Athens it is known locally as Edinburgh’s Disgrace. The unfinished nature of the building resonates with the idea of a lethargic memory. Yet, as Hunter’s art suggests, it also stands as a symbol of the fertile, open-endedness of reproduction – a copy that shuns the status of a “final” work. National Monument of Scotland, Calton Hill, Edinburgh. Photograph by Marsha Pearce. Kenny Hunter’s National Monument (In Praise of Forgetting), silkscreen 442x73cm, 2016. Shown as part of Hunter’s exhibition Reproductive! at the Edinburgh Sculpture Workshop. Photograph by Marsha Pearce. In these experiences, I recognised art as a loom; as an apparatus that interlaces the threads of history, perspective, value, power, depravities, dreams, shame and possibilities to create a textured fabric of place and space – art as a giver of context (from Latin “contextus,” con- “together” + texere “to weave”). This word “context” would become part of the focus of an artists’ talk hosted by the Saltire Society, a membership organisation serving as a support and catalyst for Scottish culture. “We live in a decontextualised space so happily,” artist Bani Abidi lamented. She was discussing her broader practice and particular contribution to the Edinburgh Art Festival. Her new work was one of seven in the art festival’s commissions programme created under the theme: the monument. 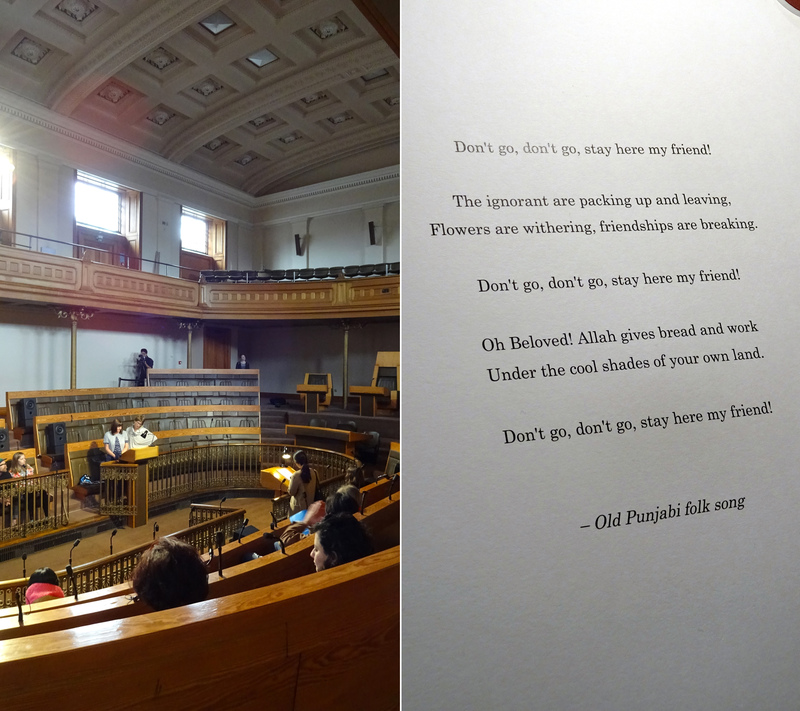 Abidi’s Memorial to Lost Words was a sound installation situated in the debating chamber of Scotland’s New Parliament House (formerly the Old Royal High School refurbished in the late 1970s in anticipation of a devolution referendum. However, the referendum legislation did not receive the requisite support. The building remains under-utilised). Abidi referenced World War I in which many Indians fought for the British. The artwork brought together the folk songs sung by female family members of the Indian soldiers – ballads of longing and loss – and the voices of these men who wrote letters about the horrors of the war; letters that were censored and never reached their addressees. Abidi’s work confronts and embraces context, connecting socio-historical dots in a sea of time, in a manner that reflects an archipelagic approach to seeing and interacting with the world in which we live. No circumstance is an island entire of itself. No situation exists in insularity. Bani Abidi’s Memorial to Lost Words, 10 channel audio installation, 2016. Presented at the New Parliament House, Edinburgh. Photograph by Marsha Pearce. This idea of archipelagic thinking (see Martinican intellectual Édouard Glissant’s writing for more on the subject of archipelagic thinking and open islands) was also palpable in the organisational structure of Edinburgh’s festivals. The visual arts festival is one in a chain of festivals held in the city each year. The other festivals are the Edinburgh International Festival established after WWII with a spotlight on the performing arts, the Edinburgh Fringe Festival, the Royal Edinburgh Military Tattoo, Edinburgh International Book Festival, Scottish International Storytelling Festival, Edinburgh’s Hogmanay, the Edinburgh International Science Festival, Imaginate Festival of performing arts for children, Edinburgh International Film Festival, Edinburgh Jazz and Blues Festival and the Edinburgh Mela. These festivals fall under the umbrella organisation Festivals Edinburgh, which has a board comprising the twelve festival CEOs/Directors. Each festival has its vision but remains an open island that is part of a larger shared ambition – an archipelago of interest and concern – for artists, the city and the country. Julia Amour, Director of Festivals Edinburgh, gives some background to the various festivals held annually in Scotland’s capital city. Photograph by Marsha Pearce. 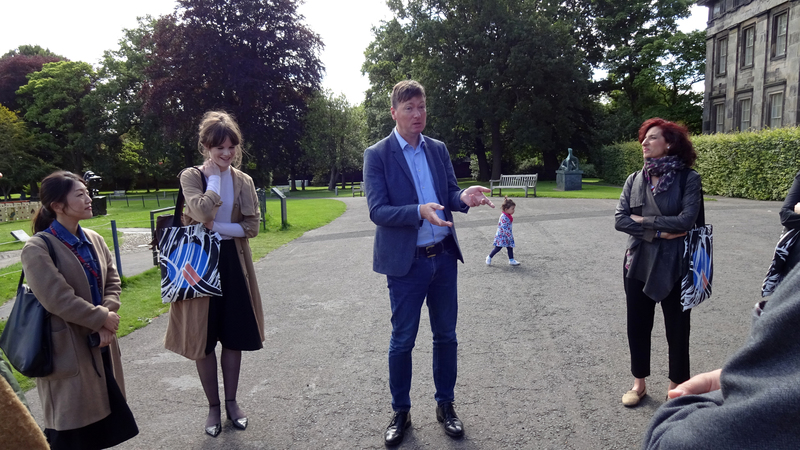 Simon Broom, Director of the Scottish National Gallery of Modern Art, speaks with the international delegates before they explore the institution’s various exhibitions. Photograph by Marsha Pearce. Such words as “collaboration” and “partnership” emerged as crucial to considerations of art management. Thinking and working as a collective arose as a strategy envisioned for institutions engaged in the practice of collecting art. “Acquisition budgets are shrinking,” said Simon Groom, Director of the Scottish National Gallery of Modern Art. “In the future it might be the exception to have one institution own a collection. There are always issues of territory and ownership but you should ask: Who is the work for? Is it for the institution or the public? When you turn it around, territory doesn’t matter,” he added. The Scottish National Gallery of Modern Art is part of a suite of spaces that fall under the banner of the National Galleries of Scotland. The other galleries are the Scottish National Gallery and Scottish National Portrait Gallery, both located in Edinburgh, and two partner galleries: Duff House and Paxton House, situated in North and South Scotland. 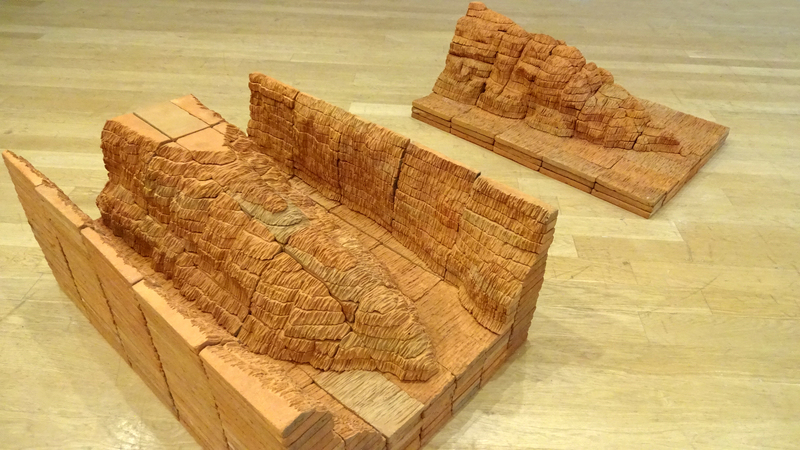 Damián Ortega’s Eroded Valley, red bricks, 2016. Displayed at Fruitmarket Gallery. Photograph by Marsha Pearce. The Talbot Rice Gallery at the University of Edinburgh has been premiering the work of women artists in Scotland under the direction of Pat Fisher. On view was a retrospective of drawings and late paintings by Alice Neel. Talbot Rice also featured for the first time in Europe, the work of New York-based artist Jess Johnson, in keeping with its TRG3 (Talbot Rice Gallery 3) programme dedicated to showing work by emerging artists. Jupiter Artland is a sculpture park and gallery founded by Robert and Nicky Wilson. This institution gives public access to the Wilson’s collection of permanent artworks that bear a relationship with the land. A walk across the grasslands and through the woods reveals art by Laura Ford, Anish Kapoor, Nathan Coley, Charles Jencks, Jim Lambie, Antony Gormley, Sara Barker and Anya Gallaccio among others. Along with these leading contemporary artists, emerging creative practitioners are given a chance to produce ephemeral works at the grounds. Of note too, were Tramway, Glasgow Sculpture Studios (GSS) and Deveron Arts. Tramway, established in Glasgow, is a converted horse-drawn tram shed. A distinguishing feature of this institution is the proximity of contemporary, visual and performing arts at the site. GSS provides a range of spaces. Among them are a ceramics studio, plaster room and metal workshop. Its services include a residency programme, which offers studio space for one year and an exhibition opportunity to an MFA graduate of the Glasgow School of Art. Deveron Arts is an organisation located in the small town of Huntly in North East Scotland. Operating without a dedicated building, the organisation’s motto is: the town is the venue. Found spaces throughout the town – including the shoe shop, church and supermarket – serve as studios and galleries for artists who are invited to live and produce work. Visits to some of the art venues revealed a sense of “the international” that is still largely confined to the geographical locations of Europe and North America. How might the meaning of this word be agitated and reconfigured? This question is a foothold for Momentum delegates – a position from which to negotiate new paths. Momentum provided a platform for many encounters and dialogues, creating a concentrated experience of art, place branding and cultural networking. 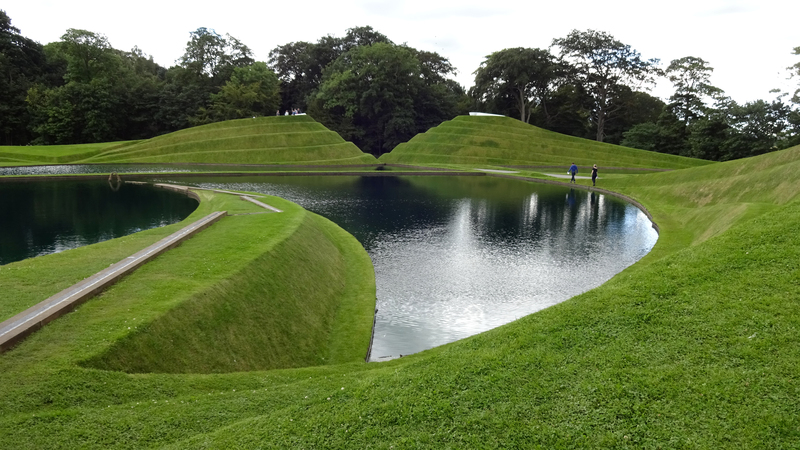 Charles Jencks’ Life Mounds is a feature at Jupiter Artland. Photograph by Marsha Pearce. 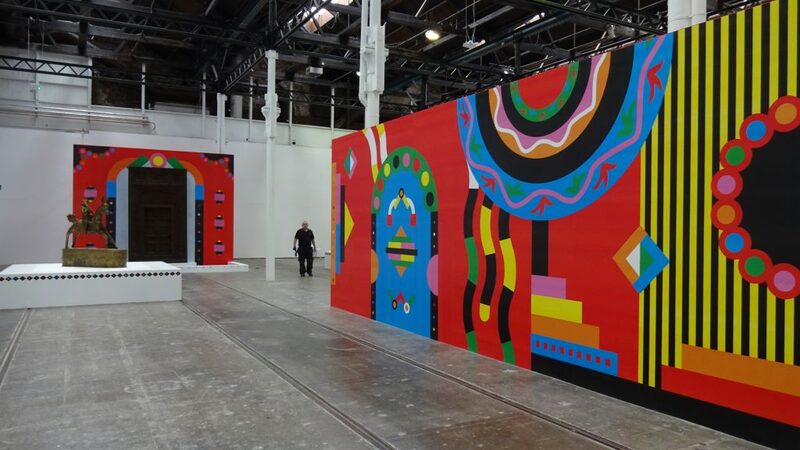 Part of the main gallery at Tramway, Glasgow. Photograph by Marsha Pearce. This report was first published on the British Council Caribbean website.